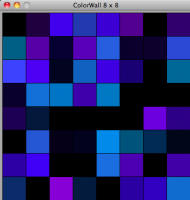 The ColorWall is a framework for implementing and displaying effects for a wall of pixels. During this workshop, you will write your own ColorWall and design effects for it. You can also see the ColorWall in action here: http://vimeo.com/16522975. First let’s work through some basic terminal exercises to learn how we use Python to work with numbers & text. Unzip/Untar the workshop exercises and go through them. 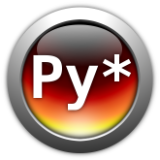 run.py – takes arguments from your environment (like a specified width and height for the wall), set up the wall and effects, and run them. 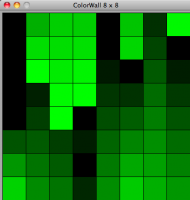 wall.py – the logic behind the matrix of squares that make up the wall. This file has a comment block at the top that summarize the interface that you will use when programming your own effects. effects.py – where effects live. This is the main file that you’ll be editing during the workshop. If you want to try doing a git clone, you can grab the ColorWall code from Git Hub and run it from there, otherwise go into the directory that was created when you unzipped/untarred the ColorWall download. http://en.wikipedia.org/wiki/HSL_and_HSV has the explanation for what HSV color space means. 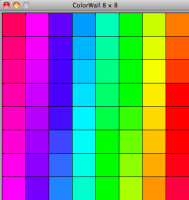 What it boils down to for the purposes of our project is this: each pixel gets 3 values: hue (e.g. am I red, green, or blue), saturation (am I pale or intense), and value (am I bright or dark). effects.py has example effects that exercise hue, saturation, and value independently.